Give us $350 million to dig for rare earth elements. Molycorp, which wants to mine for rare earth elements in California, filed for an IPO today to raise up to $350 million amid a growing interest in green. The company has developed a plan to mine rare earth elements in Mountain Pass, California and then turn rare earth oxides into things like magnets for wind turbines. It calls its strategy "mine to magnets." Right now, the world gets most of its rare earth elements from China. 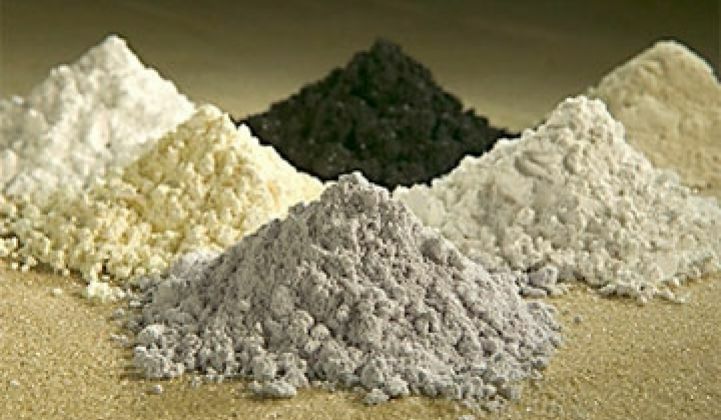 Molycorp says it is the only maker of rare earth oxides in the West. The company garnered only $7.1 million in 2009, but wants to use the proceeds from an IPO to reinvigorate the Moutain Pass mine. "The REE group includes 17 elements, namely the 15 lanthanide elements, which are cerium, lanthanum, neodymium, praseodymium, promethium (which does not occur naturally), samarium, europium, gadolinium, terbium, dysprosium, holmium, erbium, thulium, ytterbium and lutetium, and two elements that have similar chemical properties to the lanthanide elements -- yttrium and scandium. The oxides produced from processing REEs are collectively referred to as REOs," says the S-1. "One of the most effective rechargeable batteries is the NiMH battery, which is used in nearly all hybrid and electric vehicles and many other electronic products. A mixed rare earth metal alloy is used as the anode in the NiMH battery. Cerium and lanthanum are the main REEs used in the NiMH battery." Compact fluorescent lighting, ear buds, hard drive motors, even some water systems use rare earths. Rare Earth also recorded for the Motown label and had a hit with a cover of "Get Ready." Molycorp says that the Mountain Pass mine is home to more than 2 billion pounds of REOs (rare earth oxides), giving it an estimated lifetime of 30 years. Pegasus Capital Advisors is one of the main investors in the company. Pegasus is an active investor in green building and will participate next week in the Creating Climate Wealth conference, sponsored by the Carbon War Room.